ITV’s filming of Persuasion, 2007. Jane Austen based parts of her book Persuasion in Lyme Regis and could have been inspired to write it while she was staying in Sea Tree House, then known as Hiscott’s Boarding House in 1804. It was thus very exciting as well as fitting that ITV choose to film in Lyme Regis. 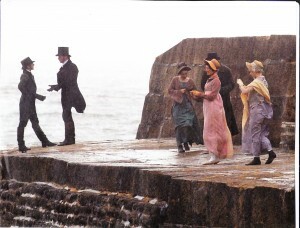 It was filmed on a wild and windy day on the Cobb itself. We watched from Sea Tree House bay windows trying to identify Rupert Penry-Jones and other famous actors and actresses. The fabulous Diana Shervington, descendant of Jane Austen and Patron of the Jane Austen Society. 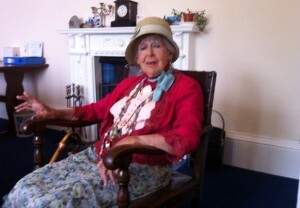 She is pictured at Sea Tree House in Tulip Tree Apartment’s living room where she gave a fascinating lecture to the Georgian Society (2012). She agreed with us that Jane could have sat looking out of the window and been inspired to write of Louisa Musgrove’s fall from the steps on the Cobb as poor Captain Wentworth failed to catch her when she attempted to jump into his arms. For those interested in Jane Austen, this is from her book Persuasion and is well worth a read when you are staying in Lyme Regis. It is a surprisingly short book but wonderfully describes the feel of Lyme and the countryside around as they travel between town (Bath) and country as well as being a lovely romance! 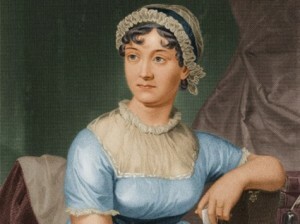 This entry was posted on Friday, November 9th, 2018 at 17:42	and is filed under Jane Austen.